Photo by Sky-Pix Aerial Photography. Minder Farm‘s popular annual corn maze off Highway 303 benefitted from a spectacular start to fall this year. But did you know that each year, the five acre maze is not just designed to be fun for those on the ground but picturesque from a birds-eye view as well? 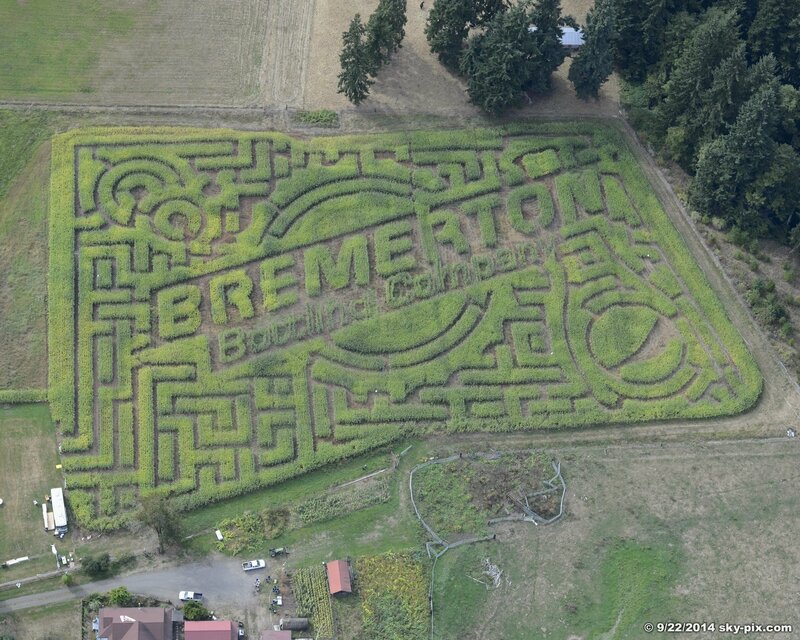 Two Bremerton companies that each call the West Hills home — Minder Meats, along with Bremerton Bottling Company — joined forces this year to imprint the latter’s logo within about 90,000 cornstalks. “People love it,” added Jim Carlson, owner of Minder Meats in Bremerton, whose family owns the storied farm off Highway 303. It’s the eighth year Minder has hosted a corn maze. The family relies on Idaho-based Mazeplay.com, which uses GPS to create the maze. It costs about $5,000 to do it, Carlson said. This year, they almost secured a deal with Geico but it fell through Carlson said. But after running into bottling company owner Carole Aughnay Dawson, he had an idea. “They’ve done an awful lot for this community,” Carlson said of Bremerton Bottling. This year’s maze, combined with great fall weather and some sharing of the photo above around social media and in the community, has been very successful, he said.